Here's the thing, just because someone is a writer, that doesn't necessarily mean that they know how to spell every single word in the English language without looking it up. So, yes. I didn't know how to spell wildebeest. I'll admit it. I made a mistake. Frankly, I'm not sure why Harold keeps me around. But you know what? 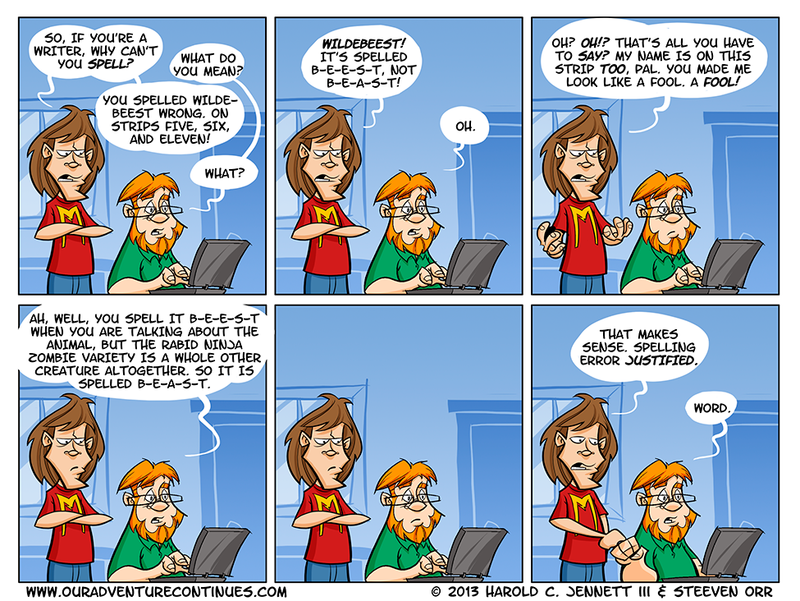 My mistake allowed us to do this here funny strip about how I didn't really make a mistake (even though I did). Plus, I love that panel where Harold and I bump fists. I swear that Harold can see inside my brain because that is exactly how I saw it all in my head. Second, would anyone be interested in owning a shirt like that? Harold and I have toyed with the idea of opening a Cafe Press (or something similar) shop and selling t-shirts and what not, but we figured it's a little early in the game to be thinking about stuff like that. However, if y'all show some interest in the idea, then we may move forward with it. Let us know at ouradventurecontinues@gmail.com or just comment here in the post. See you next week where we introduce a couple of new characters with Fear of the Unknown. UPDATE: We cracked 5,000 hits on the site today. And so I dance. You got me laughing again. And gratz on your 5000 visitors.